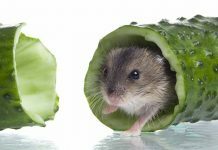 If you’ve ever done an internet search for “hamster,” you may have come across some adorable images of hamsters filling their cheek pouches with nuts, seeds, veggies, and other foodstuffs. 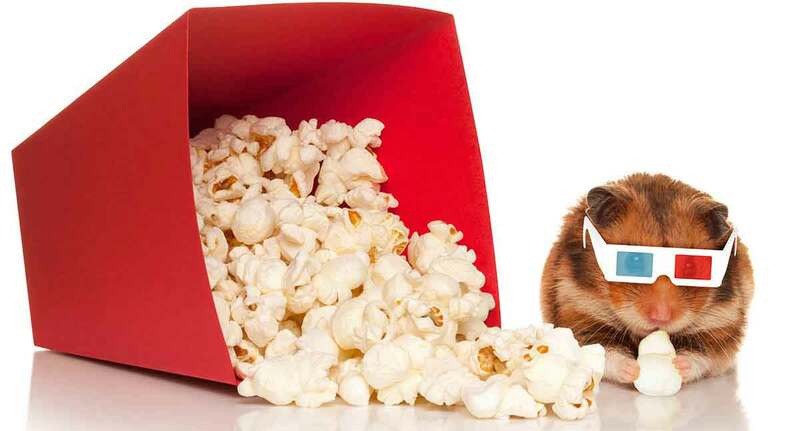 You may have even seen some pictures of hamsters eating traditionally human foods, such as popcorn. Popcorn, hamsters…wait, hamsters can have popcorn? You might be surprised that hamsters can indeed have popcorn, but only when it’s plain, fully popped, and in moderation, of course. In this article, we’ll tell you everything that you need to know about safely sharing popcorn with your “Hammie”. Yes, popcorn is safe for hamsters, but as we mentioned, only if it’s plain and fully popped. You should also take care to give popcorn in moderation. When feeding any type of treat, your pet should get the bulk of their calories from their regularly scheduled meals. 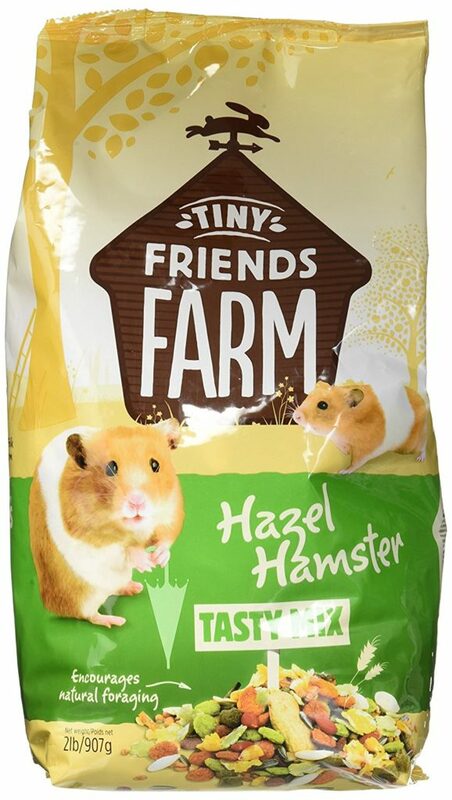 At Squeaks and Nibbles HQ we feed our hamster on Tiny Friends Farm Hamster Food. Feeding lots of treats or an imbalanced diet can result in your hamster having nutritional deficiencies. Furthermore, the popcorn should be air-popped. According to the United States Food and Drug Administration (FDA), studies have shown that the coating commonly found on the inside of microwave popcorn bags may contain unhealthy chemical compounds. Is popcorn bad for hamsters? Popcorn has its merits as a snack for humans and hamsters alike, but there are some limitations. Popcorn (or any other snack, for that matter) that is loaded with salty, sugary, buttery, and (delicious) fattening toppings lends extra calories and fat to both your and your hamster’s diet. Just as humans are prone to weight gain and health problems after consuming indulgent foods over time, hamsters are also prone to obesity, heart disease, and even diabetes if their diet is too high in fat and sugar. According to a study conducted in 2011, the hamster cardiovascular system is actually quite similar to that of a human, meaning that many of the heart health issues that we face can be seen in hamsters. When hamsters in the study were fed a high-fat, high-cholesterol diet, they developed fatty liver and diabetes. Since hamsters are prone to diabetes, it should go without saying that sugar should not be a part of their diet. Long story short, popcorn is bad for hamsters only when it’s smothered in unhealthy toppings or given in large amounts. With that in mind, let’s talk about when popcorn is good for hamsters! Is popcorn good for hamsters? Hamster popcorn is plain, fiber-rich popcorn in its most basic form. Hamsters thrive on a diet that’s rich in fiber, as fiber aids in their digestive motility. Additionally, popcorn contains nutrients that may be good for young or breeding hamsters, including vitamin A, folate, iron, niacin, riboflavin, and thiamin. 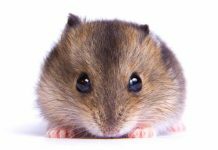 According to the book, “Nutrient Requirements of Laboratory Animals (Fourth Revised Edition),” vitamin A is essential for normal growth in hamsters. In adult hamsters, a vitamin A deficiency led to the formation of stomach ulcers. The study also indicated that a lack of folates in your hamster’s diet may contribute to their becoming anemic. Niacin, riboflavin, and thiamin all appeared to be essential for normal growth and development in young hamsters. Furthermore, a serving of popcorn also contains the minerals calcium and phosphorus, both of which aid in normal bone formation and growth in baby hamsters. Although popcorn can lend a nutritional boost to your hamster’s diet when fed properly, there is the possibility for too much of a good thing. Try to give treats sparingly and in small amounts. For hamsters, this means a few pieces of plain popcorn given every so often. Can hamsters eat popcorn with butter? Buttered popcorn contains high amounts of fat. Considering the hamster’s have tendency toward weight gain, feeding hamsters popcorn with butter is probably not a good idea. Can hamsters eat cheese popcorn? Even though you can safely give bits of cheese to a hamster as a treat, it’s not safe to give your hamster cheese popcorn. This is so because the orange “cheese dust” on cheese popcorn is actually pulverized cheese that’s been combined with a lot of fattening additives like oil, sugar, and salt, to name a few. As we mentioned previously, hamsters are incredibly prone to weight gain. Thus, they should not be given super sugary or fattening treats. Furthermore, the “cheese dust” on cheese popcorn likely contains garlic powder and onion powder, both of which are toxic to hamsters. Can hamsters eat salty popcorn? No, hamsters should not eat salty popcorn. 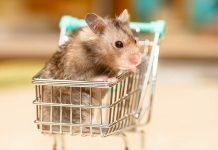 While it’s common for some types of pet rodents to have a salt lick or mineral wheel in their enclosure, hamsters actually don’t need supplemental salt in their diet. Just like people, hamsters may develop age-related disorders. 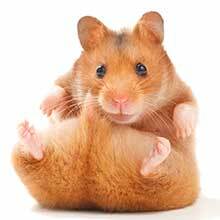 As we mentioned before, hamsters may develop heart disease and diabetes, but they are also prone to renal (kidney) failure. And similarly to people, increased consumption of fats, salts, and sugars may lead to the earlier onset of these diseases. Therefore, it’s best to leave your hamster’s salt consumption to the salt that they get in their pellets or block. Can hamsters eat popcorn kernels? Hamster eating popcorn that has been fully popped is fine, yes. But what about unpopped kernels? Hamsters can have the corn cobs (popped or unpopped) that are sold by pet stores and that are intended for small animal consumption. However, you should never give a hamster “regular” popcorn kernels that are found in human popcorn bags. They can choke on the kernels. Additionally, due to their strong hoarding instinct, hamsters may feel inclined to stash multiple popcorn kernels in their cheek pouches, where the kernels may become stuck and cause a cheek impaction. Yes, hamsters can have popcorn, with a few provisos. It should be plain, air-popped, and given just a few pieces at a time. Fattening toppings are a no-no for hamsters, since they tend to gain weight easily and are prone to heart disease. Additionally, you should never give a hamster unpopped kernels, as they could present a choking hazard or damage your pet’s cheek pounches. Bhathena, J., Kulamarva, A., Martoni, C., Urbanska, A. M., Malhotra, M., Paul, A., Prakash, S. “Diet-induced metabolic hamster model of nonalcoholic fatty liver disease.” Diabetes, Metabolic Syndrome and Obesity: Targets and Therapy, 2011. Mayer, J., Thompson, T. “Clinical Veterinary Advisor: Birds and Exotic Pets”. Saunders 2013. Fourth Revised Edition.” National Academy Press, 1995. Next articleWhen Do Guinea Pigs Sleep?